20:15- 21:30 > The Delgado Brothers – NL PRIMEUR! The Delgado Brothers Band take 1st place at The 2016 International Blues Challenge in Memphis TN. And Joey Delgado wins The Albert King Award for Best Guitarist. The Delgado Brothers Band deliver a mighty musical expression of artistic soul, rhythm and blues all spiced up with a fiery blend of hand crafted original music. Beloved for their live shows and renowned for their signature LA sound, the Delgado Brothers are a delicious fusion of soaring guitar virtuosity, melodious harmonies, and rock solid musicianship. Yet the main reason their music strikes such a universal chord is their message in the music lyrics reflect and reveal the ethos and pathos of our common humanity. Native Angelenos, recording artists and the subject of a feature length Rockumentary film, ”In Time”, The Brothers, Joey D on guitar, Steve on drums, big brother Bob on bass and David Kelley on Hammond B3 all out on stage performance promises to delight, inspire dance, uplift and maybe even bring a tear to your eye. Critically acclaimed for their Greek Theater performance, and their volume of all original songs featured on three self produced cd’s “Let’s Get Back”, “A Brothers Dream” and “Learn to Fly”. 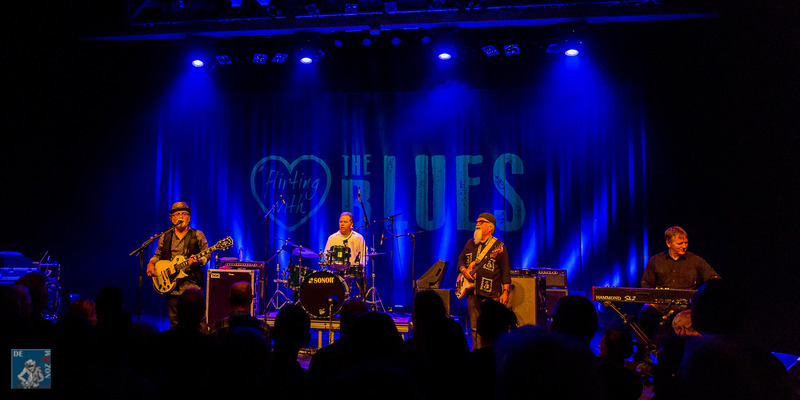 After all these years of hard work and being on the road they entered the International Blues Challenge in Memphis for the first time and won straight away. In the mean time Guitarist Yoey Delgado also got rewarded as best guitarist. Lees hier het uitgebreide interview met The Delgado Brothers in dé Blueskrant, nr. 6, augustus – oktober 2016.